Energizing sky blue turquoise is shaped in graceful elongated teardrops to create these stylish earrings. The reconstituted turquoise stones are inlaid in rhodium-plated sterling silver and the earrings are finished with sterling silver fish-hook wires. The rhodium plating prevents tarnishing and adds a bright shine. To keep these earrings looking beautiful, clean them gently with a soft polishing cloth and avoid solvents and ultrasonic cleaners. 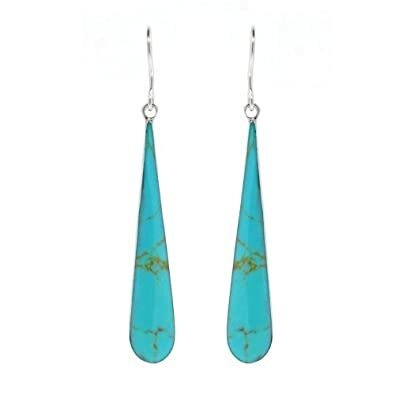 Hurry up and Save 57% off Sterling Silver Turquoise Inlay Long Teardrop Earrings.